34 Inch Double-Drum Smooth Drum Roller Rental – Wacker-Neuson – RD 12A-90, is available for rent in Rochester NY, Ithaca NY and the entire Western New York region from the Duke Company. 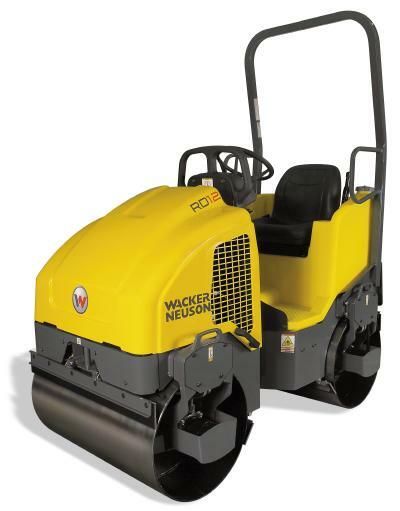 The rental Wacker Neuson RD 12A-90 hydrostatic vibratory roller available to rent, is a highly capable one ton roller and features dual drum drive and articulated steering controls. The front drum vibrates while the rear drum remains static – ensuring a high quality asphalt finish. Features include a pressurized water system that results in consistent water flow, easy access servicing, lower sound levels. The machine is ideal for the following compaction applications: road repairs, driveways, parking areas and other asphalt surfaces.